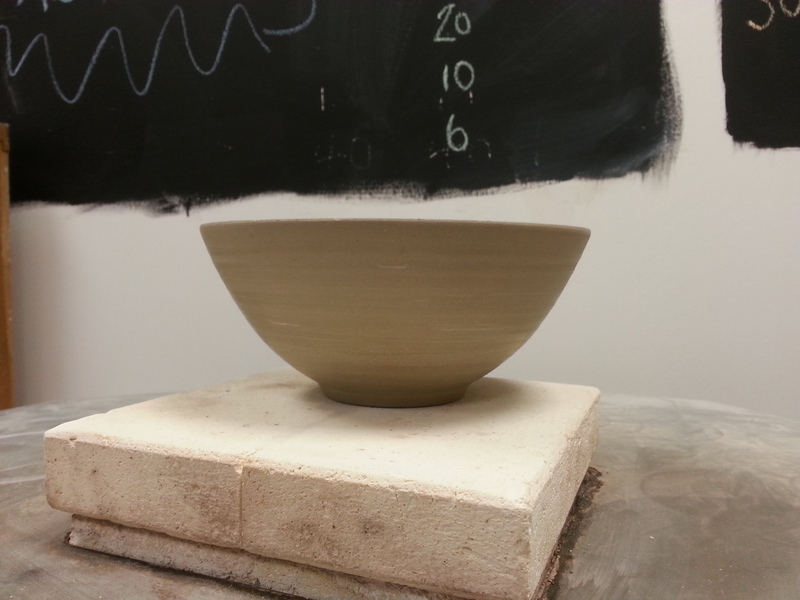 Last Tuesday, I spent the day with Stuart Broadhurst for my eagerly anticipated throwing lesson. He lives in a tiny village called Askham, in Cumbria, the village for the impressive Askham Hall. The day has grown on me as each day since has passed and has had an immediate impact in the workshop. 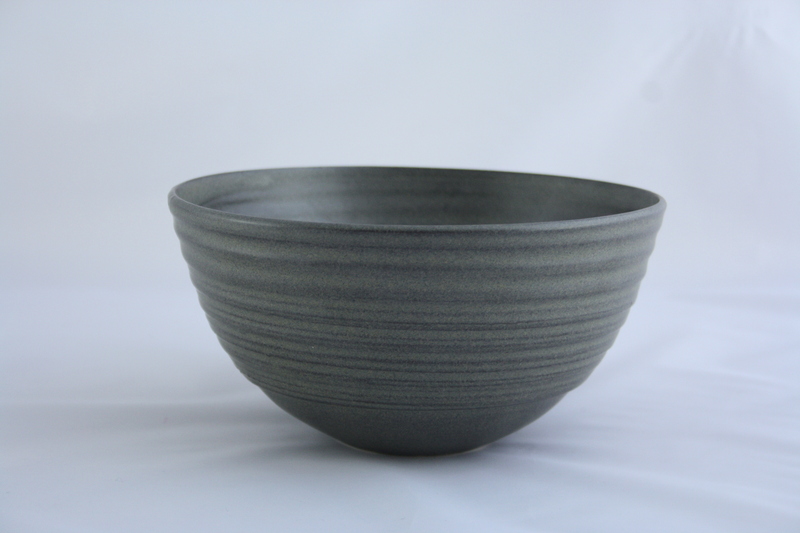 It has had a profound influence on my thinking as a potter and how I negotiate my workshop. This aspect is totally unexpected and is very welcome. I went to learn more about throwing and came away with a whole lot more. This is Stuart at his wedging table. The first thing he taught me was how to wedge properly. 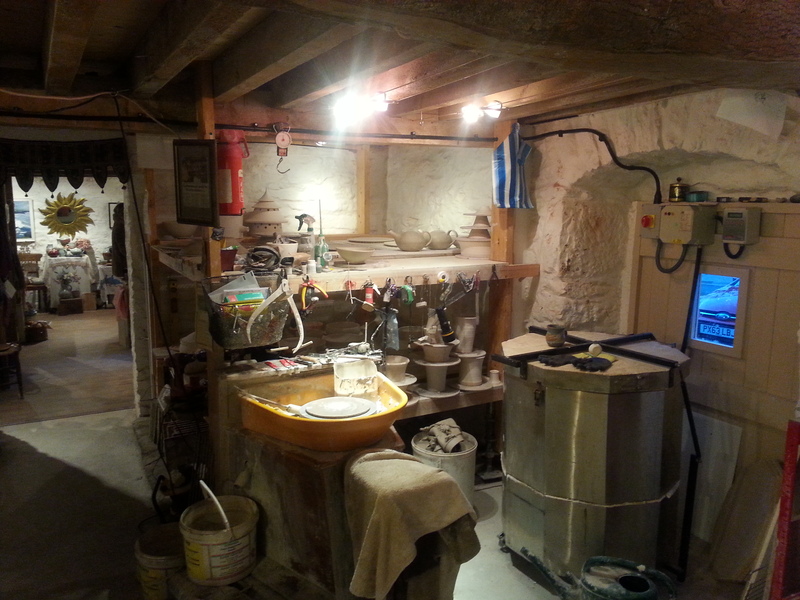 He said that clay preparation is vital to the outcome of a good pot. I used to spiral wedge but I don’t anymore, as Stuart showed me another technique, and it really does make a difference. This is his wheel (the one that I used while I was there) and a view through to the lovely shop managed by his partner Mara. It was clear immediately that my technique needed some tweeking. I knew that and it was one of the reasons that I went to see him. I understood the changes that I needed to make but found it difficult while I was with him on a fast wheel that was new to me. Towards the end of the day, as I started to throw a few bowls off the hump, my fingers began to respond. 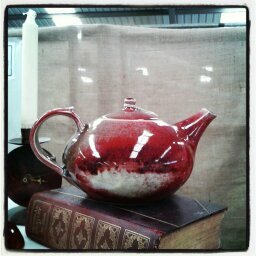 What I think has affected me most subsequently, though, has been the general pottery chat that we had throughout the day. 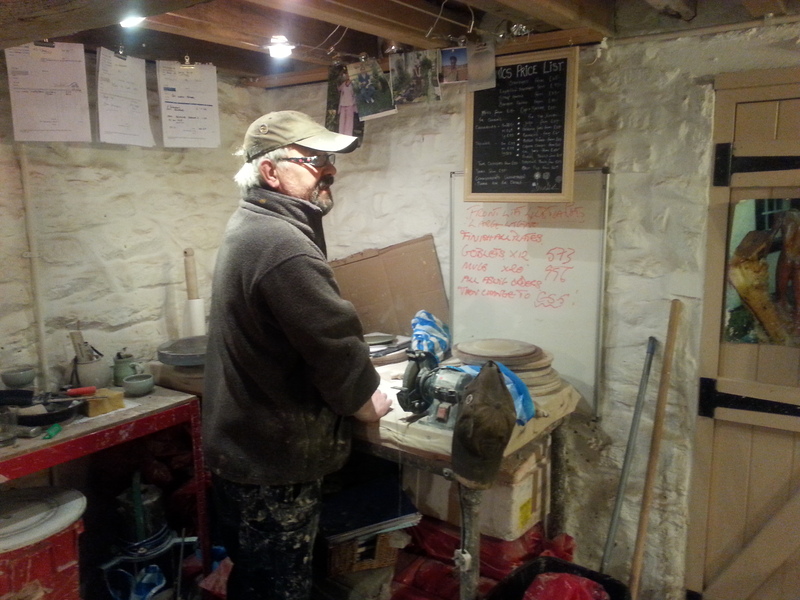 We spoke about finishing off pots, about details, about form, about what shelving to have in the workshop, about turning chucks, about reclaiming clay – most of it was totally new to me, as up to that point it had just been me and my wheel. As we chatted we would pop into the shop and pick up some example or other, one of his pots or another potter’s that he stocks. You can’t pick these things up unless someone tells you. This is what an apprenticeship is for. Stuart has taken on an apprentice this year, Ben, and he is in the best place. It is interesting – as I sit before my wheel now, having been to see Stuart, I approach the clay and the act of throwing differently. I have more purpose, intent, confidence. I haven’t thrown much but I am pleased with the results. The pots feel different and I like how they feel. 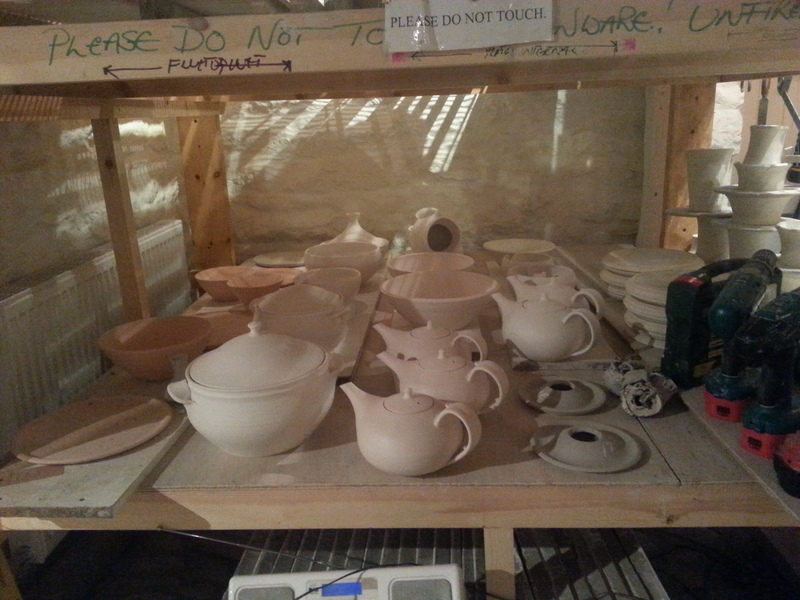 Now I have to make for Craft 2014, which takes place in the middle of January, and I can’t wait to get started. I am having a pre-Christmas sale! There is 20% off both of these two, if you buy two or more, until 19th December. The final date for UK postage is 20th December. 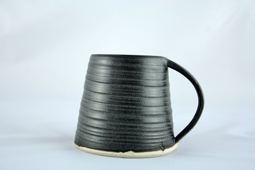 They are the large mug and medium bowl in black. I think they would make great gifts… If you would like to participate, email me (dovestreetpottery@gmail.com) and I will arrange the sale through my Big Cartel shop. Christmas is coming and I feel I have let things drift in the workshop, which I have not found particularly satisfactory. This is partly because I am breathing again after the busy autumn and partly because of what is happening tomorrow. I am having my first throwing lesson and in the back of my mind I suppose I have been been waiting for this day before embarking on a whole lot of new throwing. Everything I have learnt so far has been under my own steam – through much trial and a lot of error reading books, watching youtube clips and just simply experimenting. I have come to the point, though, that if I am to move my throwing on I need a lesson – and now seems to be as good a time as any. It’s the end of the year, orders are made, and come the middle of January I will be participating in a trade fair which, hopefully, will start the whole cycle rolling again. So, I feel it’s best to have the lesson now before the cycle begins in order to start on the best foot. You are currently viewing the archives for December, 2013 at The Hopeful Potter.